George Conway (Kellyanne's husband) and Neal Katyal: "Trump's Appointment of the Acting Attorney General Is Unconstitutional." In Opinion Op-Ed contributors Neal K. Katyal and George T. Conway III write, "President Trump’s installation of Matthew Whitaker as acting attorney general of the United States after forcing the resignation of Jeff Sessions is unconstitutional." So honored, once again, to write this with one of the best lawyers in America, @gtconway3d. The collaboration, and what it says about our Constitution’s ideals and how they transcend party, are deeply meaningful to me. Important from Conway and Katyal: Skipping over the Deputy AG and every other Senate-confirmed official in the Justice Department to install Whitaker as acting AG doesn’t merely raise questions as to Trump’s motives; it’s probably unconstitutional. George Conway and Neal Katyal argue in the NYT: "Trump’s Appointment of the Acting Attorney General Is Unconstitutional"
Former Obama solicitor general @neal_katyal and conservative lawyer @gtconway3d argue that Matthew Whitaker's appointment as acting AG is an illegal attempt to bypass the Senate — especially given that other Senate-confirmed DOJ officials were available.
.@neal_katyal and @gtconway3d argue that Whitaker's appointment is unconstitutional (violated the Appointment Clause of the Constitution) because he is not Senate confirmed and, unlike Mueller, reports directly to the president. George Conway has an op-ed in today's NY Times decrying Trump's appointment of Whitaker as unconstitutional. His wife, Kellyanne, spent the morning defending Whitaker's appointment to the press corps. This is the most interesting marriage in America. I've done some more digging into the Whitaker fake Attorney General appointment. There are even more problems beyond those that @gtconway3d and I wrote about last week. It'll drop tomorrow. I don’t have a strong view on whether this argument is *legally* correct, but the replacement of Sessions seems like about as egregious an effort to circumvent the “advise and consent” requirement as one could imagine. Whitaker's appointment as Acting Attorney General is unconstitutional. Re-upping this. We are already in a constitutional crisis. The Whitaker thing -- it's unconstitutional. Huh. I don’t know enough about this stuff, but this argument is much better than I thought it would be. I will let the great dialectic of law twitter work itself out. Also, some of the country's most distinguished legal scholars say that Whitaker is serving unconstitutionally (e.g. nytimes.com/2018/11/08/opi…), so...you know. Extremely normal government. Smart piece by @neal_katyal & @gtconway3d . To conservative originalists ask yourself: Did the Founders intend for the Chief Law Enforcement Officer of the US -- and a principal officer of a dept -- not to be subject to advice and consent? Why aren’t the Senate Democrats, beginning with you @SenSchumer, rising up to contest this unconstitutional appointment? "Trump’s installation of Matthew Whitaker as acting attorney general of the United States after forcing the resignation of Jeff Sessions is unconstitutional. It’s illegal....anything Mr. Whitaker does, or tries to do, in that position is invalid." While many are writing about the statutory issues governing the appointment of the Acting Attorney General, these two lawyers argue that the appointment itself is unconstitutional. One of them happens to be married to Kellyanne Conway. I don't know how you argue with this piece except to say "shut up honey you're making my job really difficult"
This is pretty damn convincing. So what happens now? "Mr. Trump’s installation of Matthew Whitaker as acting AG of the U.S. after forcing the resignation of Jeff Sessions is unconstitutional. It’s illegal. And it means that anything Mr. Whitaker does, or tries to do, in that position is invalid." This argument seems right on principle, in terms of separation of powers. No Senate confirmation, no check on the executive. Inferior officers, OK. But the person who wields the enormous power of the attorney general -- for how long? Opinion | Trump’s Appointment of the Acting Attorney General Is Unconstitutional. Neal Katel and George T. Conway III present a reasoned case for the unconstitutionality of Trump's appt. of Whitaker. They cite Clarence Thomas in their defense. So where do you originalists now stand? From Kellyanne Conway’s conservative husband, no less. Trump's appointment of the Acting Attorney General is unconstitutional. 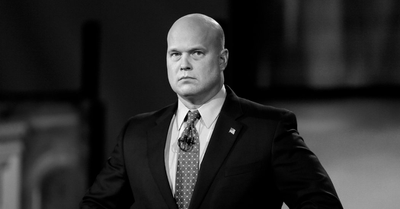 Trump’s Appointment of the Acting Attorney General Is Unconstitutional nyti.ms/2yZ1tyP - Even if Mr. Whitaker's appointment is unconstitutional and demands the advise and consent of the Senate, what will be the quality of that deliberation? @JMLudes @gwaynemiller @pubstory @TedNesi @TimWhiteRI @wpri12 @DYStateofMind @lexikriss @SykesCharlie @Morning_Joe @NormEisen @matthewacole @REspositoNYC @ryangrim @samfbiddle @MackyM @tracysefl @jreidenberg @MarcDunkelman @ericschnurer @OfficialMLK3 @RIFuture @urbandemos @SwearerCenter @FEPS_Europe @SenSanders @CoryBooker @jimmykimmel @LindseyGrahamSC @AaronBlake @ruthbenghiat @kingc_i @nickakerman @SenJohnMcCain @JohnBrennan @morningmika @kathrynfcohen @mgmcquarrie @BuildSolidarity @KeishaBlain @SSRC_org @RichardHaass @ishaantharoor @madeleine @guardian @BrownSociology @TimmonsRoberts @BrownUniversity Nearly all constitutionally aware folks recognize that Trump prompts an overt constitutional crisis w Whitaker appt as AG. Thx @gtconway3d & @neal_katyal. nytimes.com/2018/11/08/opi… Where is the #ResponsibleRepublican now? Step up GOP to protect Constitution & maybe save your party.